In What Ways Have ASDA Maintained Competitive Advantage? In What Ways Have ASDA Maintained Competitive Advantage? The supermarket industry is fiercely competitive and is currently dominated by the "Big Three" companies: Sainsbury's, Tesco and ASDA. To ensure that they remain in these three, it is important that each company gains and maintains their own competitive advantage. So, in what ways does ASDA do this? 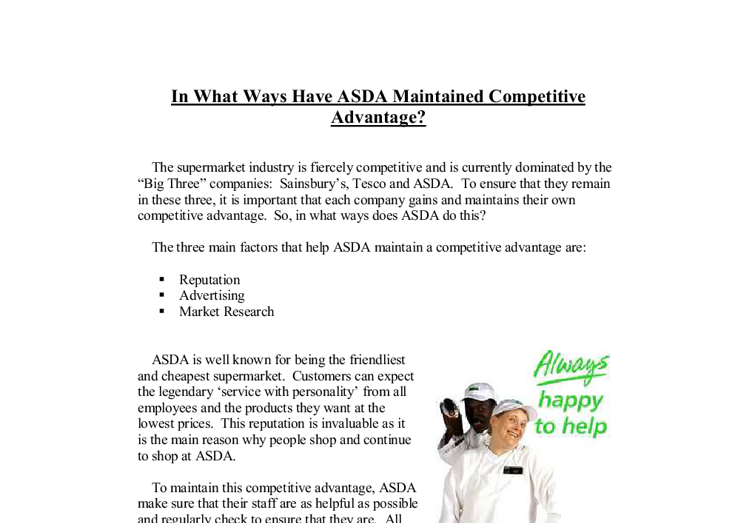 The three main factors that help ASDA maintain a competitive advantage are: * Reputation * Advertising * Market Research ASDA is well known for being the friendliest and cheapest supermarket. Customers can expect the legendary 'service with personality' from all employees and the products they want at the lowest prices. This reputation is invaluable as it is the main reason why people shop and continue to shop at ASDA. To maintain this competitive advantage, ASDA make sure that their staff are as helpful as possible and regularly check to ensure that they are. ...read more. This association will make people who tend to shop at different supermarkets want to shop at ASDA if they feel that they offer a better service and are better value. Market research is also vitally important to maintain their competitive advantage. Market Research ensures that ASDA provide everything that their customer needs and also finds new products that customers would be interested in. To make this competitive advantage as long-lasting as possible, ASDA frequently research into customer care, consumer issues and product development, as well as ongoing advertising campaigns and price comparison. This helps ASDA keep 'ahead of the game' and offer goods and services that their main competitors do not yet offer. Customers are also welcome to submit their feedback to ASDA through questionnaires available on their exit. These questionnaires help ASDA to find out the needs of their customers by interacting directly with them. Although these are the three main factors that help ASDA maintain a competitive advantage, others are just as important. ...read more. New specialised counters are constantly being added to help customers find what they want more easily and to ensure that the food is of high standard. These include specialisation in pizza, chicken, and fresh salads and fruits. Specialisation allows ASDA to assign employees to make a certain type of food. By just concentrating on this food, this ensures that it is of high quality and the employee will be as helpful as possible because they will know a lot about it. 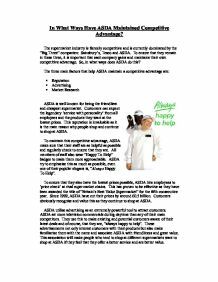 Conclusion ASDA rely on competitive advantage to keep their existing customers and to encourage other people to shop there. ASDA have many ways to ensure that they maintain this advantage. These include market research, advertising, the Internet, innovation and most importantly, their reputation. All of these factors guarantee that ASDA is more attractive to shoppers than their main competitors and make people want to shop there. ASDA take competitive advantage very seriously and this has caused them to win numerous awards including, "Britain's best value supermarket" and also become the most popular supermarket in the UK. ...read more. A method called cost-plus pricing is used by The Sun whereby price is closely related to the costs of production and printing the actual newspaper daily. The Sun has used product differentiation when setting prices, especially between the 35p issues Monday to Friday, and the 55p edition on a Saturday. As such, our expertise or familiarities with events within Hoboken are above par. This is our core strength. * First to market: A television show highlighting the virtue of Hoboken. We will develop brand recognition and a reputation for outstanding television programming focusing on the Hoboken community. Reasoned Kapoor. "You must take atleast three tonnes. I will come with you to the market and help you push it to the retailers.". Girjee thought over Kapoor's suggestion. If the retailers could be convinced, his problems would be over. For, once they picked up the stocks, his sale was complete. Company mission The mission of Object Software is to produce entertainment software which matches the highest international quality standards. Achieving this goal takes a good deal of time and investment. A typical game for the PC will take around 2 years to develop. 'We don't set out to make ads. The ultimate goal is to make a connection', states Dan Weiden of one of Nike's ad agencies. One ad featured the Beatles and clips of Nike athletes Michael Jordan and John McEnroe juxtaposed with pictures of non-celebrities also engaged in sports.